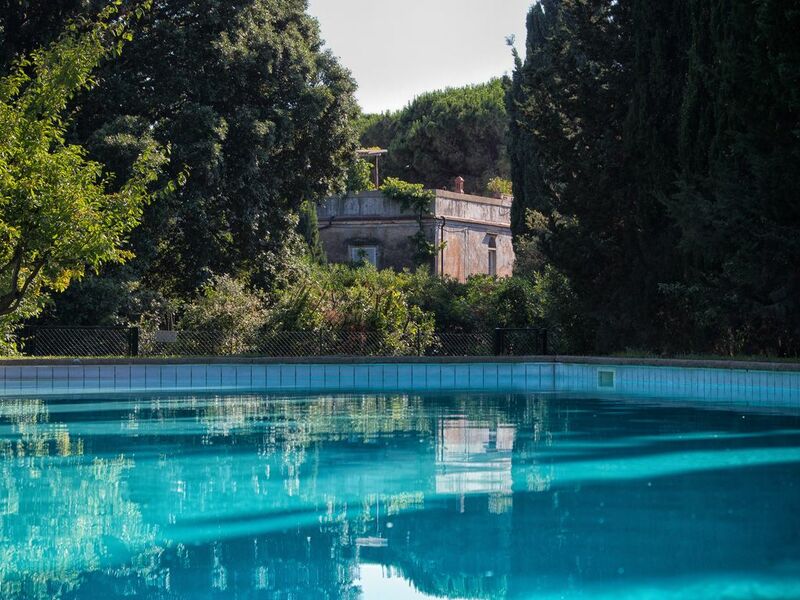 The Tenuta Le Case Nuove estate is located approximately 1.0 km from the sea and has in the hinterland approximately 150 hectares of land with grain fields, macchia and olive trees as well as a small lake where one can take long walks. The villa with its approximately 800 m2 of space, was built around 1800 and has served since as the summer and country residence for the family. There is a classically arranged garden in the front. In the shade of 150 year old trees, even the hottest days feel cool. The fattoria is furnished very nice and has at its disposal all modern day conveniences such as gas central heating, a wash machine, dish washing machine and a state of the art electrical system. Swimming pool 20 x 10 metres surrounded by olive trees, grain-fields, sea view from pool; beach very near, within walking distance. We offer organized nature walks as well as bicycle tours! New Yacht Port Marina Cala de Medici in Castiglioncello - Sailing boat rental is possible! Familien vår hadde noen uforglemmelige feriedager i Fattoria Nuevo i Castiglionchello. Vi ble tatt svært godt imot og satte stor pris på at det var vann og andre nødvendigheter i kjøleskapet da vi kom, sent på kvelden. Huset ga oss den ekte italienske stemningen! I deilige sommerdager tilbrakte vi mesteparten av dagene utendørs, i den koselige bakhagen - hvor vi spiste mange gode måltider - og ved det store bassenget. Det var god boltreplass for uteaktiviteter. Vi likte også godt at det var gangavstand til strand og restaurantene i sentrum, og mye å utforske i områdene rundt. We spend 1 week at the Fattoria and really enjoyed our time in the villa. If you are looking for a place to relax and enjoy family time 'this is the place'. The pool is soo big you don't want to leave the house. Castiglioncello is a Nice little village with old villa's and an excellent starting point to visit for example Pisa or Lucca. Susanna was our host and she did everything to make us feel comfortable. I would certainly recommand this villa to friends and family. thanks a lot for your kind words. We are happy you enjoyed your stay at the Fattoria Le Case Nuove and we hope to see you soon. Castiglioncello is located on the Mediterranean coast, 18 km south of Livorno. It is a well established small town with old pine trees and offers along with beach much more: tennis, diving, miniature golf, riding, theatre and ballet in Castello Pasquini, small restaurants and trattoria, street cafes, great shopping, nightclubs and a weekly market. This holiday spot which has evolved since the middle of the 19th century is usually visited by travellers from Rome, Florence and Northern Italy. Other Activities: Biggest yacht port of the area, modern dance.